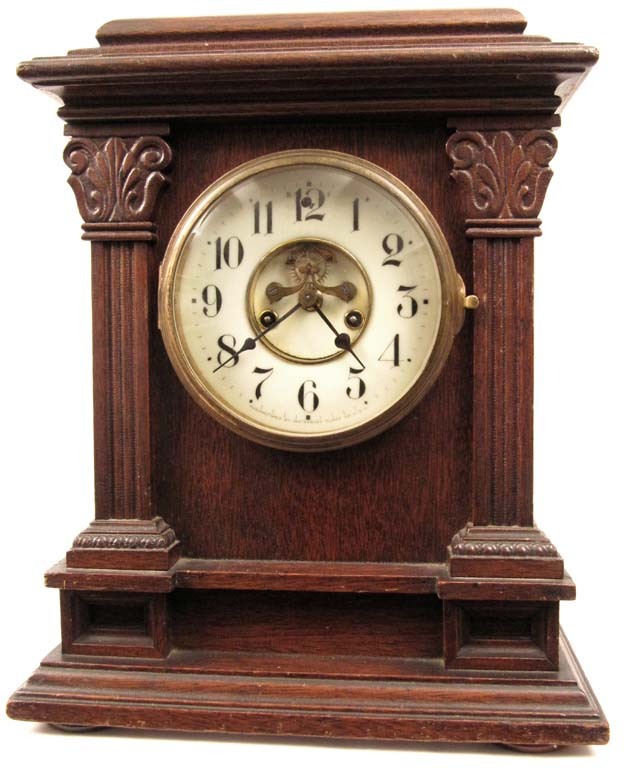 Waterbury "Suffolk" oak cabinet clock A seldom seen model, this one is in great, original condition. Solid oak case with pressed designs, not one case flaw and a good original finish. It has a signed double sunk porcelain dial with visible jeweled escapement. There are no hairlines or chips. The bezel is heavy cast brass with a convex beveled glass. This clock was well cared for and it retains the original hands, pendulum and signed key. There is a good label on the case bottom. 8 day with hour and half hour strike on a resonant cathedral gong. It is in good running order. 15" tall.